Joyce is addicted to the craft of quilting. She has belonged to the Lake and Mountain Quilt Guild for a number of years, and has served as an officer in the organization. These are the quilts that she has entered in the guild’s biennial shows. 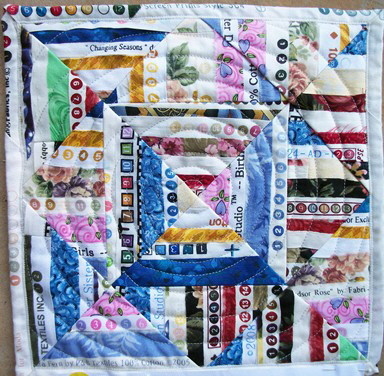 2006 was the first year that she exhibited her quilts. This one was titled “Cat Nap”. 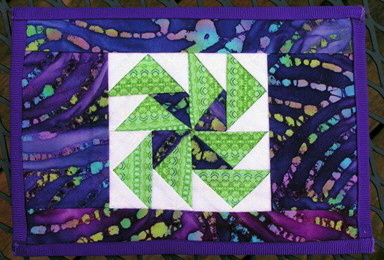 For every show, there is a “Challenge”, with set rules for a group of quilts made by guild members. This was Joyce’s 2006 challenge entry, and it was to be the size of a postcard. Her second entry in 2008 was called Flying Pinwheels. 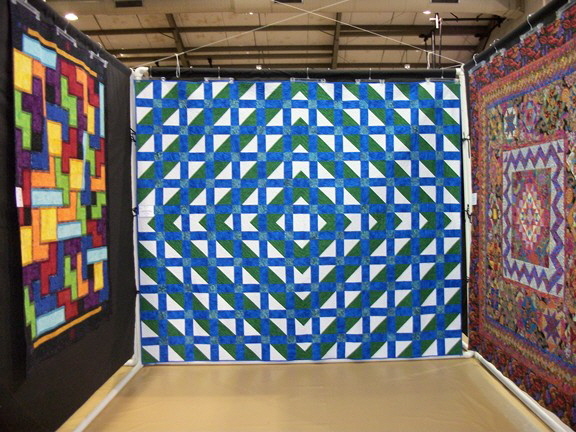 In 2008, Joyce entered two large quilts in the show. This beautiful quilt was displayed just inside the door to the exhibition hall! She named it “Shining Stars”. 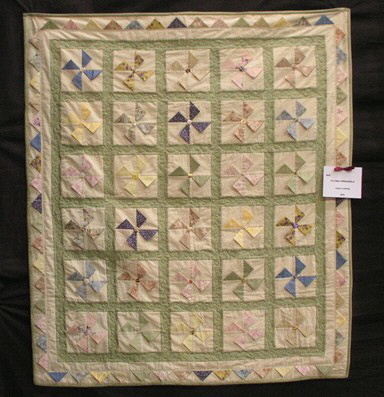 Her challenge quilt for 2008 was sold at auction for the benefit of Altzheimers research. 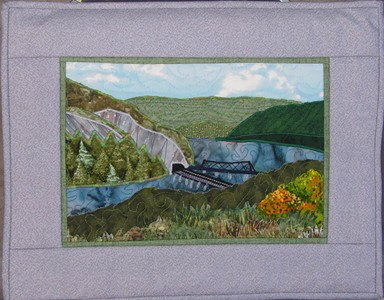 Joyce’s 2010 entry was a small landscape wall hanging, named Harpers Ferry, and made from a photograph of Harpers Ferry, West Virginia. 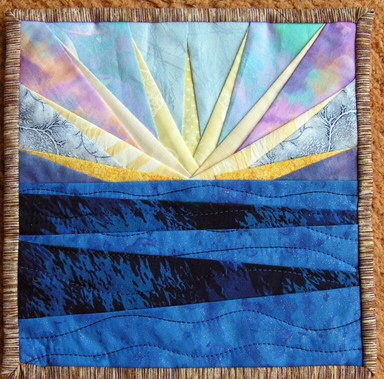 For her challenge quilt in 2010, Joyce used the waste fabric selvages to make this wall hanging. It was called “Don’t Overlook Those Fabric Selvages”. In 2012, Joyce exhibited only this striking wall hanging. Its name is simply, “Spring”. Joyce exhibited this monster in 2014. It was displayed prominently at the end of a row of quilts, where its dimensional design could be appreciated. 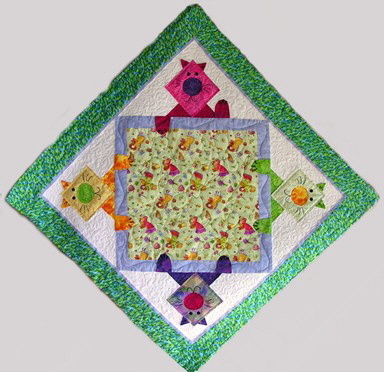 The 2014 challenge was to design a small quilted wall hanging from only three colors chosen at random, plus one other optional color. It was to address the theme, “the colors of Keowee”. 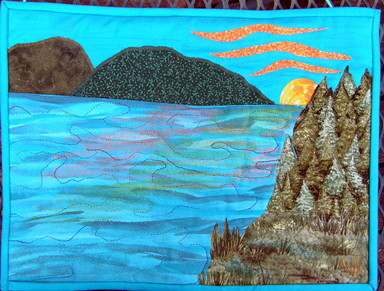 Its name is “Sunrise Over Lake Keowee”. 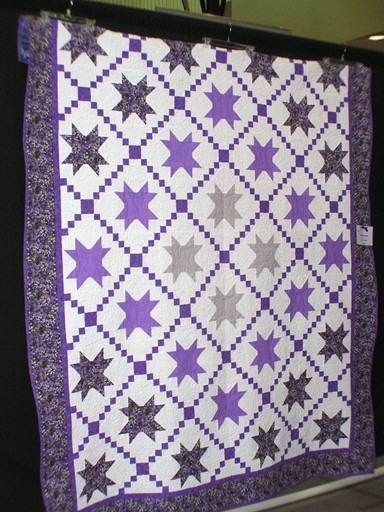 These quilts were to be sold to benefit a charity, and this one sold for $50.00!